These TV Stands Will Stay Upright, Even In Busy Crowds! Display Products Or Samples On The Attached Shelves With Confidence! 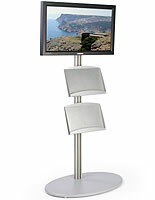 These TV Stands Will Bring People Over To Take A Look At Your Advertising Showcase! 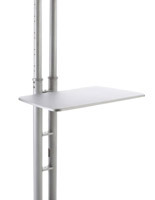 Flat TV stands can hold 32" to 42" television weighing up to 70 lbs. (2) Acrylic shelves conveniently display merchandise or hold electronics. 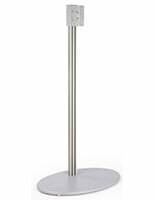 Large rounded MDF base for stabilizing stand, even in heavily trafficked areas. 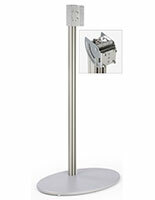 Plasma stands, LCD stands, and other TV stands have a rounded MDF base for stabilizing the stand. 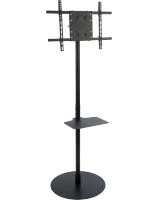 These plasma stands, TV stands come with a bracket for mounting a 32" to 42" plasma or LCD television. A VESA bracket has been designed alongside manufacturers to fit most makes of television, and we include the necessary hardware to mount most plasma or LCD TVs, though some may require specific screws you can purchase at any hardware store. TV stands are perfect for use in retail stores, malls, offices, airport lounges, or even restaurants as an effective advertising tool. LCD stands, TV stands feature four (4) plastic strips that fit along the back of the extrusion to help hide wires and keep them out of sight. 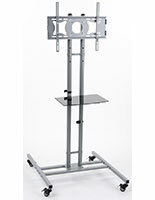 Monitor stands, TV stands include two (2) acrylic shelves that can be used to show merchandise or hold electronic devices such as DVD players. These shelves are adjustable on the extrusion, so that you can display different sized items. 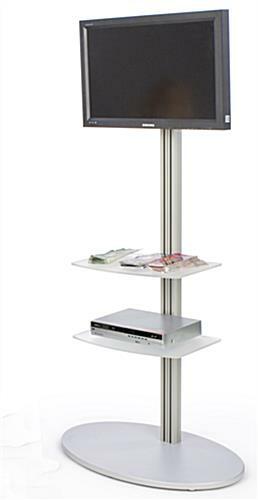 These TV stands have a satin silver finish that easily blends in with nearly any surroundings. 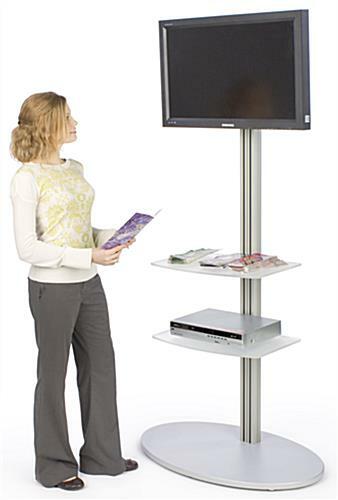 Buy TV stands today to help promote your company or products!